My mother in law has always had a special fondness for orange sticks. As long as I have known her, she has had a stockpile somewhere within her reach. When I found this recipe last year, I immediately thought of her. We have made them for her the last couple of Christmases. While they take some time to make (a few hours if you’re not a chocolatier—I am NOT), these really are better than the store bought variety. Instead of an orange flavored jelly center, these are filled with the real thing. If you’re out of the holiday goody making mood, bookmark this recipe for next December. They will make a perfect addition to a holiday sweet exchange (if you can bear to part with a few). Slice the ends off of the oranges, score the peel from one end to the other, and remove the peels off the oranges. 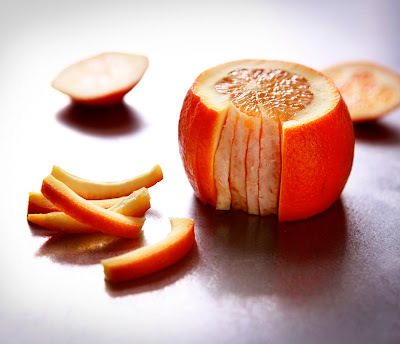 Slice the peels into thin strips and trim the edges. Using a medium size pot, place the peels in boiling water and blanch them for about five minutes. Rinse the peels, and repeat this process a second time. This is done to remove the bitterness of the peels (and it makes your kitchen smell wonderful). Prepare the simple syrup by combining the water and sugar in a sauce pot. Bring the syrup to a simmer, place the peels in the pot, and simmer for 1 hour. Check them often to make sure the syrup hasn’t boiled off. Once the peels have cooked, remove them from the pot, and place on a rack to cool and drain. Melt the chocolate over a double boiler. 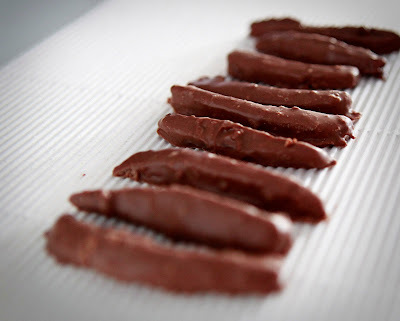 Dip the candied orange peels in the chocolate, remove them quickly. Allow them to dry completely on waxed paper. Store these tasty treats in an airtight container.